“Draw the Law” is a weekly short post where I try to visualize a legal concept. It is designed to be helpful to small business owners and give them a quick overview of various aspects of the law that affect them. 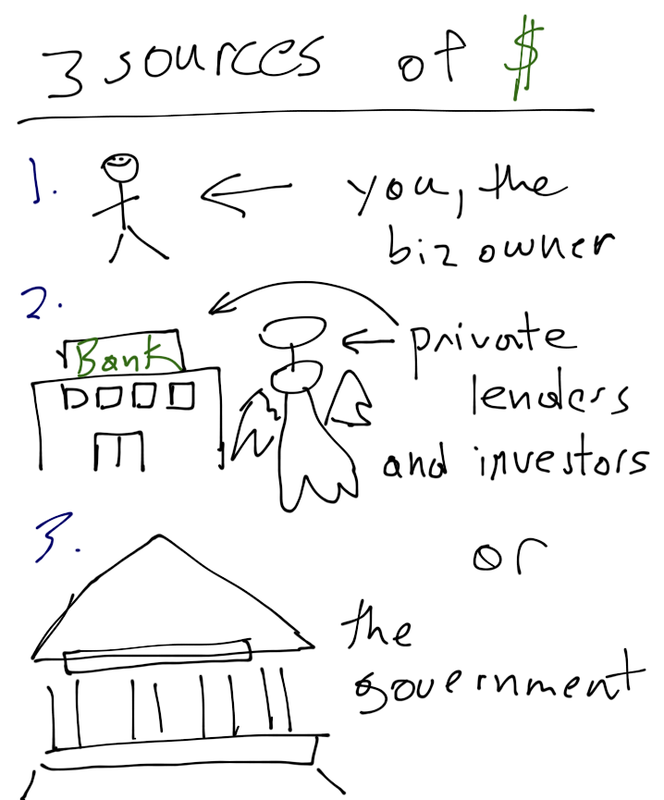 For the next couple of posts I will detail how to finance a start-up. In the prior post of this series we finished up with the variety of entity organizations, namely, sole proprietorship and partnership. Now, that we have a business drawn up and have its “skeleton” outlined we will talk about the “blood” of the business or the financing of it. What we need now is money! Personal – what can you leverage on your own to raise money? Today, I will solely focus on personal methods of securing capital and then in Part II, I will discuss Private and Governmental sources. All of these represent the variety of personal sources that you could go to for money needed for starting your business. I will now handle each one. Savings is one of the easiest methods. You just take what you have and spend it on the business. All your cash in the bank use it on purchasing equipment, supplies, etc . . . and it is as simple as that. However, the reality is unless you are starting a business that has very little capital needs you are going to need to turn to other sources that draining your checking and savings accounts. 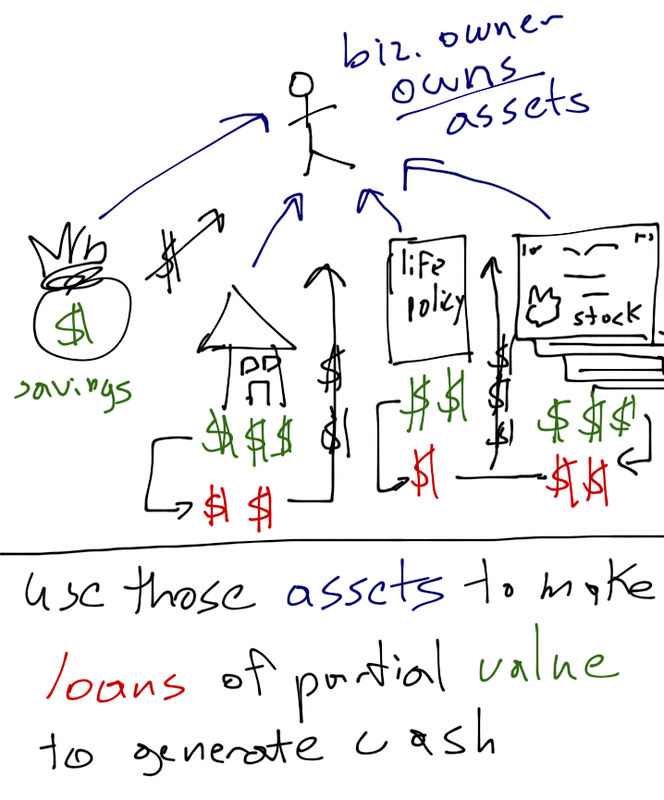 In the case of life insurance, certain types of retirement plans, home equity, and stocks and bonds many people end up borrowing against these assets to raise the cash they need. While, it is true you could cancel your life insurance policy, sell your home or condo, or sell your stocks and bonds most people would like to keep these assets for the long-term. Instead they opt to borrow against the value of the item. Typically, the loan that you are get will not be the full value of the item being borrow against, but some percent. For the life insurance loan you would need to contact your insurance company. For a home equity loan the bank that you owe your first mortgage on would be the first to turn to. To use any stocks or bonds you own as collateral contact your broker. This method is as close to using your own savings to generate the buying power you need for equipment and the like for your business. However, everything that goes on credit generally faces high interest rates if you cannot pay the balance of immediately. In general, a credit card for the business is a good thing to purchase office equipment, make quick small payments, and emergency purchases, but should not be the primary method of financing the business as the interest rates will drain you over the long run. Here in Hawaii, we generally have a good family system where mom and dad, aunts and uncles, grandparents, and even calabash cousins will loan us some money to help our dreams come true. While we like to trust in our family and friends, and hope for the best, it is also smart to just put the terms down in writing. It should not be taken as an insult, but help avoid the creation of two different stories and future conflict should the business be unable to pay back the loan. In addition, by having a promissory note, your relative or friend is in a better position to tell tax authorities that the money given to you was really a loan and not a gift, which have differing tax consequences. and the rate at which you will repay. 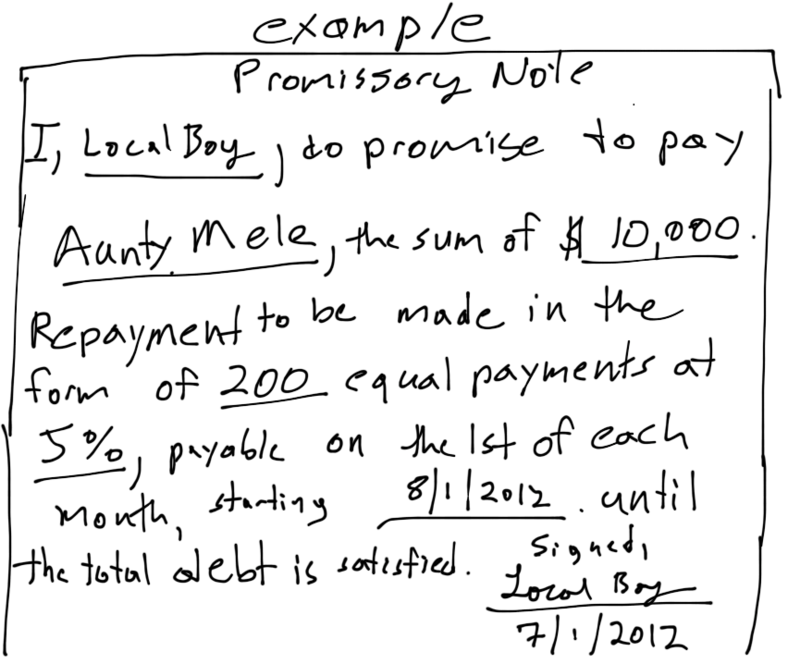 You can draft a promissory note yourself, so long as it has all the above components. Just be sure to sign it, make a copy (to remind yourself of the repayment), and have the appropriate family member or friend hold onto the note. If you are either party, the business owner or the family member or friend, and really concerned about such a loan you can always speak to attorney to make sure everything is in order. In addition to seeing a lawyer, for any method of financing you will probably want to meet with a financial adviser and accountant to make sure you have a firm grasp of how you will raise the money, expend it, and any debt obligations attached to it, as you get your business off the ground. See you on the next draw!